Studying under legendary artist Paul Pope is one heck of a thing to add to your resumé, but as most creators will tell you, no matter how you get your foot in the door, the only thing that determines whether you sink or swim in this industry is the quality of your work. For Chris Hunt, the early reviews are very promising for the debut issue of his creator-owned series, Carver: A Paris Story, which came out on December 2nd (and which we reviewed here). It’s been an long journey to get to this point, and Chris joins us to discuss the history of this story, how he came to study with Pope, and the future of Carver. Before we get into Carver, I want to know a little about your background. Were you much of a comic fan growing up, and when did you realize you wanted to become a creator yourself? I’d say I was mostly obsessed with his comics early on, just trying to absorb (what I know now) to be a very unique intersection of styles, with regards to both storytelling and drawing. I had been obsessed with Batman: The Animated Series before that, but I didn’t find the comics to be as visually appealing as the cartoon was, so it took me some years before I actually started getting into mainstream Marvel or DC comics. I spent a summer working in a comic shop in Boise between my junior and senior years of high school, which proved really formative. I was allowed to take anything home I wanted to read as long as it came back in sellable condition, so that was when I dug into the heavy hitters of the late 20th Century like Miller and Moore, and then started trickling down into Kirby, Ditko, etc. It all spiraled from there. 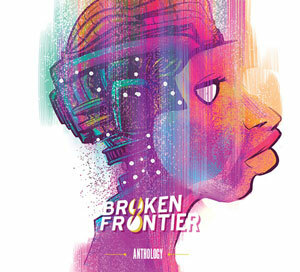 You were a resident artist at the Atlantic Center for the Arts and studied under Paul Pope. How did that come about? Well we were friends already, casually, through our online exchanges and a few meetups in NYC and at cons, so he told me he’d been asked by ACA to lead this residency and that I should apply for it. It definitely wasn’t implied that if I wanted to be a part of it, I could just waltz in. I had to work for it like anyone else. I had to come up with an original short story from start to finish that would go into the application, and be vetted not just by Paul but others at ACA itself. 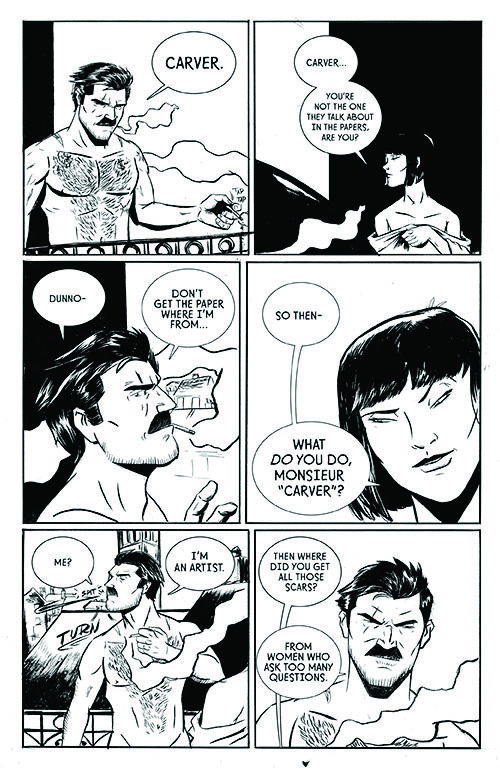 That original short story, funny enough, was ultimately the first Carver story. What were your biggest takeaways from that experience, either in life or art? Once we got down there to the ACA campus it was just incredible. We all joked that it was like a Bond villain’s compound if it had been placed in the middle of Jurassic Park. The whole experience was truly life-changing though, and I mean that in all earnest. What I learned, the people I met, the things that I made – they’ve all come to be a part who I am and what I do. On a technical level, the biggest takeaway for me was having a breakthrough with the brush. For years I had been trying to learn how to use that tool. It was something that I aspired to but up until that point I’d mostly just been frustrated by it. Working with Paul at ACA, well, it wasn’t like a rigid drawing class where it was about a strict curriculum. There was really a lot of discussion and exploration around the philosophy of storytelling, of drawing and inking. I learned that physical mastery is only a small part of using these tools. Your head has to be in the right place, your confidence has to be secure. That to me is the single most important thing I gained from my experience there. 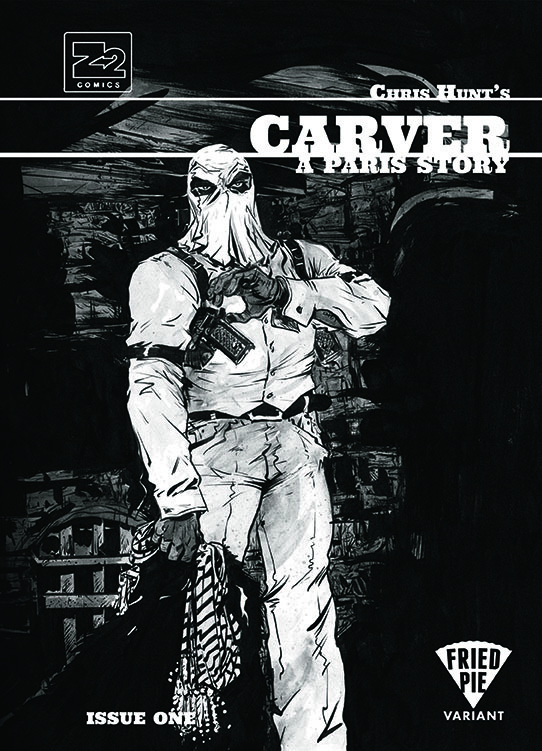 Your initial concept for this Carver story came from a personal experience of yours in Paris back in 2010, but that never came to fruition. Can you tell us a little about what changed and how this new version, the one that we see now in the comic, came about? Well it hasn’t been a secret that a lot of the story was inspired by my time with the real Catherine abroad. We had been dating before she left for a year to study in Aix-en-Provence, and I was excited to visit her while she was there. Our situation was rather ambiguous romantically though, which led to some tense moments during the last few days in Paris before I left. That really was the foundation for the original version of the story. It was kind of a “what if” we never talked again but ended up back in Paris together 10 years later. What ultimately changed me, and in turn the story, were the deaths of my two best friends in March, the month I had decided to start drawing the book. One friend was diagnosed with terminal cancer, the other died riding a train down to Idaho to see the dying friend. By the beginning of May they were both gone. It was all so sudden and rather traumatic for those of us involved, and for me I began to realize how sheltered I had been up to that point in my life – that having had this awkward romance in Paris really paled in comparison to what had just happened to me and the people around me, which included Catie. So what changed is that the book became a story about the cost of outliving people you care about, and where that takes you emotionally, and can a person drag themselves out of that dark place, and emerge from the emotional armor they built around themselves to cope with it. There’s a very interesting dichotomy at play between the titular character Carver and the hooded Stacker Lee, where they don’t necessarily behave in the way we typically expect from a hero and villain. What is it about these two that compliment each other and challenge our notions of good versus evil? What’s fun for me is knowing where this is all going to end up, so it’s interesting for me to see the different reactions to Stacker and Carver. Since I’m playing with a lot of tropes both visually and within the story, people reading the book have been making their own assumptions about what’s unfolding, and how the people are behaving, which is very exciting to me. The main difference between Stacker and Carver, perhaps the only real difference, is that Stacker understands what he is and why he does what he does. That’s why he literally wears a mask. Whereas “Carver” is really the mask that Francis wears, but it’s become so familiar over the years that he’s forgotten where that mask ends and his true self begins. He’s still a terribly effective human being, but that’s the problem. At this point in his life he’s like a car that only has two gears; one forward and one reverse. Maybe people are getting a sense of it already, but I think what I’m trying to challenge about the notion of good versus evil in this story is that they’re both just a matter of perspective. Right now the only person to kill anyone in cold blood, or be openly violent, is the main protagonist. Sure, Stacker has a little girl locked in a basement, but has he threatened her? Has he abused her? All he’s done so far is tell her he’ll protect her. I think it’s more interesting that outside of putting a mask on the guy and him “telling” the audience he’s a bad guy, Carver is actually (so far) the nastier guy. 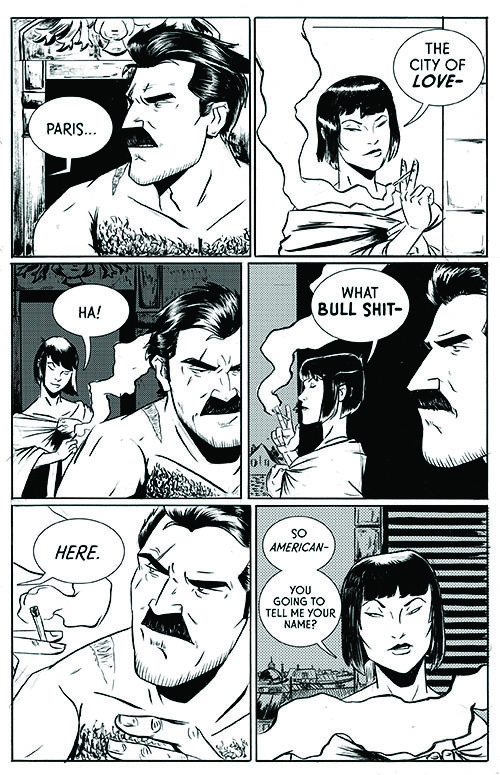 Paul Pope contributed a short story to the first issue. Is that something you co-ordinated in order to compliment your story, or was he working on his own? 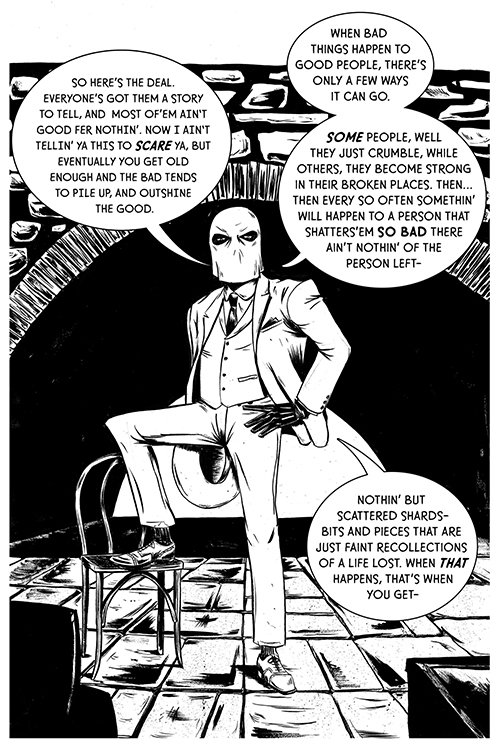 Paul and I have collaborated now on a couple of shorter stories, and our style is pretty loose. 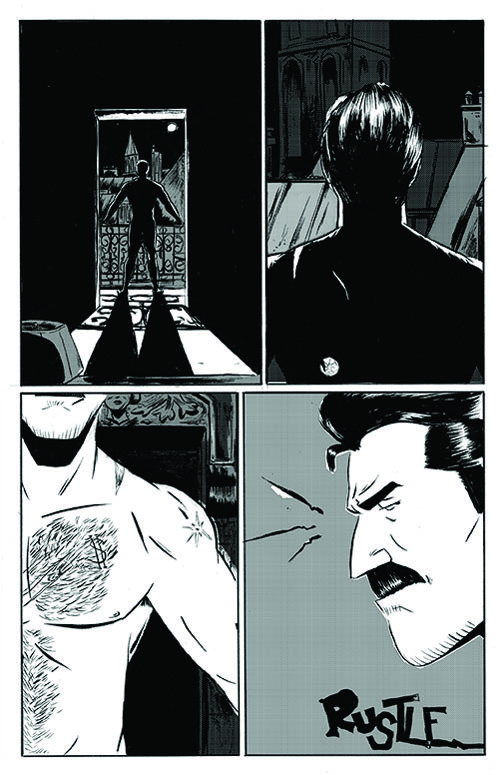 We wanted to do something of a character study while making an homage to the European comics that inspired me to make Carver. Beyond that, we both have a fondness for Paris, especially in the 1920s, so we more or less just geeked out about what we thought would be cool to show, and what would that imply? For instance, the “sailor” is quoting Emerson to Francis in French while on a roof watching Josephine Baker through a skylight. Carver mentions he saw her perform back in New York City. That’s just the first seven panels. Already there are implications that perhaps Francis is more than meets the eye, and that’s what Paul focused on. That’s more or less the formula of the book though – the peppering of specific yet seemingly ambiguous or unimportant details that in some cases are very important to what is happening, or just help to expand the boundaries of the sandbox this particular universe occupies. How long to you intend to work on Carver? Is it a long-running story or is there an end in sight? I intentionally set Carver’s universe up so that I could tell stories for as long as I was willing to write them and people were willing to read them. It isn’t laid out in minute detail, but I have about a three-decade span of story I’d love to explore, not just by myself, but with other writers and artists too. For instance I think it would be fun to do some more light-hearted, straightforward adventure stories – stuff that explores more of Francis’s back story. As far as the overarching narrative that begins with A Paris Story, it would conclude in World War II. There’s a lot of that actually being set up in this first arc even, but it won’t really be obvious for a while. Ultimately publishing more of these stories comes down to readers engaging with it and wanting to come back to the characters and the world that’s being established right now in the first arc. I can tell you that I’ll keep writing and drawing them no matter what, just because of how much I love to let my imagination dwell there. Are there any other comic projects in the works? It’s hard to think beyond concluding this first arc of Carver right now, especially since I feel a lot of pressure to give my baby its best chance to grow up and survive in the real world (hahaha). Paul and I are planning on collaborating again soon, and I have a sci-fi story I’ve been meaning to get to for a while, called 01-AD, so we’ll see. It’s taken a long time just to get to the starting line with Carver, so I’m going to see how I’m doing when this is all wrapped up.